UIM Records has been on the musical radar since 1999 but it was not until five years ago that the production company came into its own. The initials stand for Unity In Motion and Uptempo International Music. According to Andrew 'Anju Blaxxx' Myrie (the label's co-owner and senior engineer/producer), UIM brings something different to the entertainment landscape. "We are an independent music and film production company that has the capability and capacity through our entire production team, to produce and distribute finished products and services to not just for the local market, but also the international market," Myrie explained. Based in Millsborough, upper St Andrew, the label debuted in 2006 with the Purge rhythm which featured songs from Vybz Kartel, Mavado, Bounty Killer, Capleton and Sizzla. UIM's breakout song was 2007's Dagga Dat by Bragga on the 300 Round beat. Follow-up rhythms included the Sanction, Journey, Beach Bunx, Coolie Gal, Nymphomaniac and Klappaz which produced songs by the top dancehall acts. UIM also produced singjay Tommy Lee Sparta's big hits, Psycho and Tom and Jerry; Konshens' Don't Diss Mama; Haffie Come Back by Cherine Anderson; and No Worry by Demarco. Last year was a busy one for UIM. The label released EPs by Blak Diamon (Life Too Sweet); Vybz Kartel (Gaza Man Cry); Tommy Lee Sparta (Grim Reaper); Popcaan (Unruly) and Bugle (Life Span). Apart from Myrie, the UIM team comprises Shawn 'Blak Diamon' Myrie, Tanya Thelwell, Robert 'Dinearo' Graham, Wayne Touzalin, Kadeem Christy and Matthew 'Keely B' Keaveny. For 2013, UIM Records plans to continue the momentum of spewing hits and steering the careers of signed acts like Black Diamon, Keely B, Iya Champs and Total. 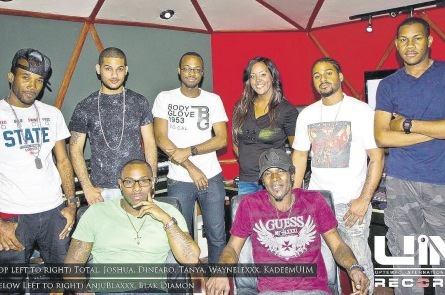 Pending projects include the Jupiter and Sky Vodka rhythms, and singles from I Octane, Demarco, Vybz Kartel, Tommy Lee Sparta, Popcaan and Konshens.